So far eaglepointescs has created 6 blog entries. Edward Hickey and his wife execute a warranty deed to Eagle Pointe Park Subdivision for Lot A and set forth the conditions for maintenance. 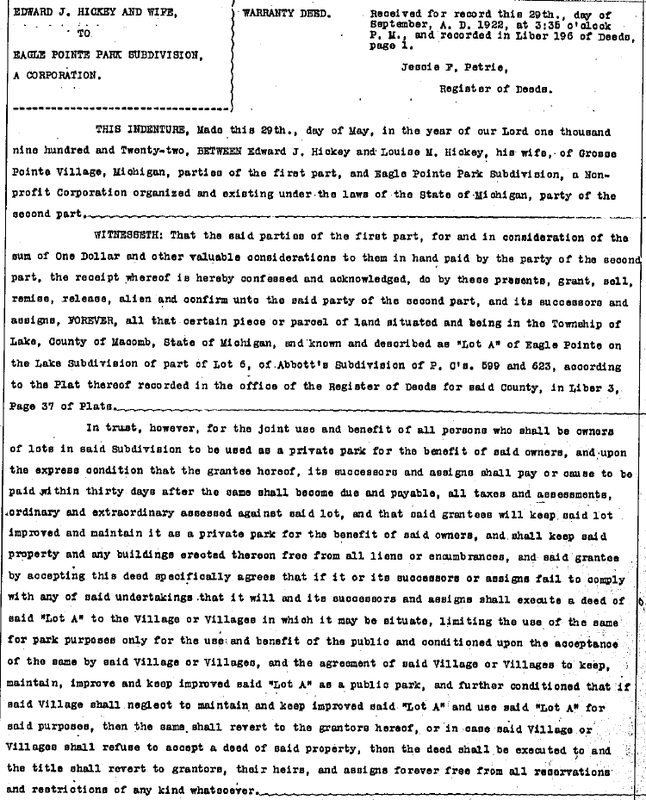 Subdivisions begin flourishing with single residencies, and, in 1922, a final draft of the Articles of Incorporation for the Eagle Pointe Subdivision were approved. 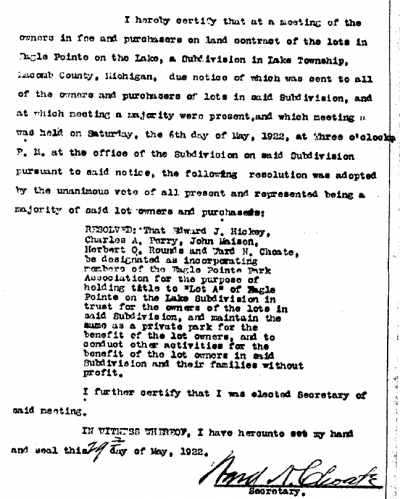 October 16, 1844, Samuel Abbott by power of attorney sold to Charles Godfric Berger. He sold the north half of lot 5 for $210.00. November 13, 1844, James Abbott sold of Jean Jacque Lajeune. the north half of lot 3 for $200.00. January 6, 1845, James Abbott sold to Joseph DeSchruyler the south half of lot 3 for $220.00. July 12, 1847, James Abbott sold to Marie Rose DeFer the south half of lot 2 for $200.00. July 14, 1847, James Abbott sold to Nicholas and Israel Maison the south half of lot 6 for $200.00. March 21, 1848, James Abbott sold to Augustin and Dominique Dayon the north half of lot 1 for $200.00. May 29,1848, James Abbott sold to Paul Marsac and Louis Tremble the south half of lot 5 for $200.00. They received about 100 acres apiece. June 22, 1848, James Abbott sold to Louis Fraser and David Jean the north half of lot 6 for $200.00. These transactions continued until the early part of the twentieth century. Each family would lease their lots for a certain number of years, receive cash instantly, and then lease out the land to another subcontractor. 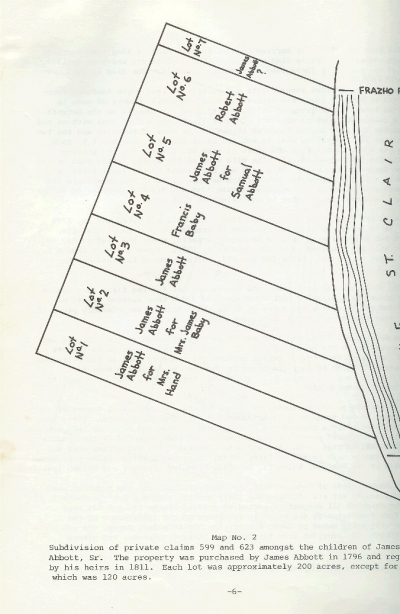 Well into the 1900’s, the lots became neighborhoods, flushing out the tenancies and farm owners. 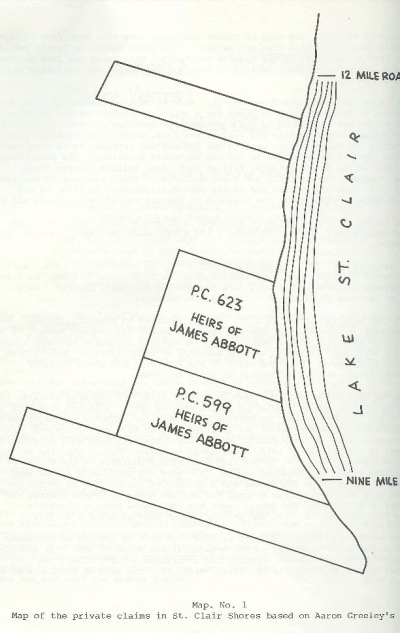 James Abbot, Sr. is most well known for being the original owner of private claims 599 and 623 on the southwest coast of Lake St. Clair. These two holdings were located between present-day Nine Mile Rd. and 12 Mile Rd. More specifically, the private claims spanned from about Nine Mile Rd. to Frahzo, with 599 taking up the southern portion and 623 the northern. When James Abbot, Sr. died, his wife and children gained full rights to his property on 1 June 1811. His family, then, allotted portions of the land to joint tenants, in which the land was maintained by a community effort. Private Claims 599 and 623 remained in the Abbot family for over three decades, until both were sold to individual owners in 1844. Although both Private Claims stayed in the Abbot name for quite some time, specific fractions of the lots were sold off independently by each of the Abbot children. After James Abbot, Sr.’s wife, Mary, died in 1821, their six children held complete ownership of the lots. Shortly after this transfer of possession, five of the children sold their property rights to James Abbot, Jr. Subsequently, James Abbot, Jr. sold Private Claims 599 and 623 to willing buyers outside of the family. 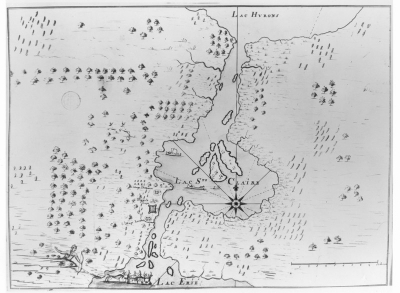 In late 1760, the English took over this coastal landscape in order to open up trading with the Northwest Territory and the rest of the St. Lawrence waterway. Fort Pontchartrain, today’s Detroit, slowly developed into a bustling seaport, filled with Anglo-Saxon immigrants. 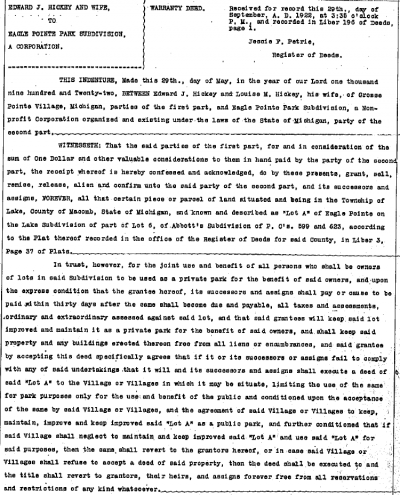 One particular Irish immigrant is still known today for his land holdings of present-day Eagle Pointe. James Abbot was born in Dublin in 1744. After traveling from Ireland to Canada, he migrated to Detroit as a young man in 1768. He worked with various proprietors upon his arrival, created trading businesses among other firms within the Northwest Territory. 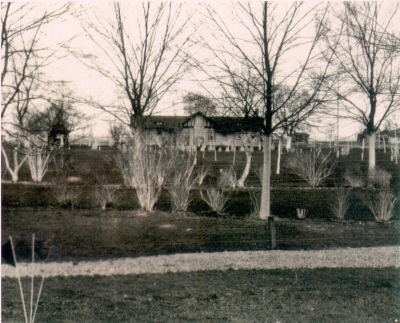 Abbot eventually opened a family business, James Abbot and Son, in 1780. 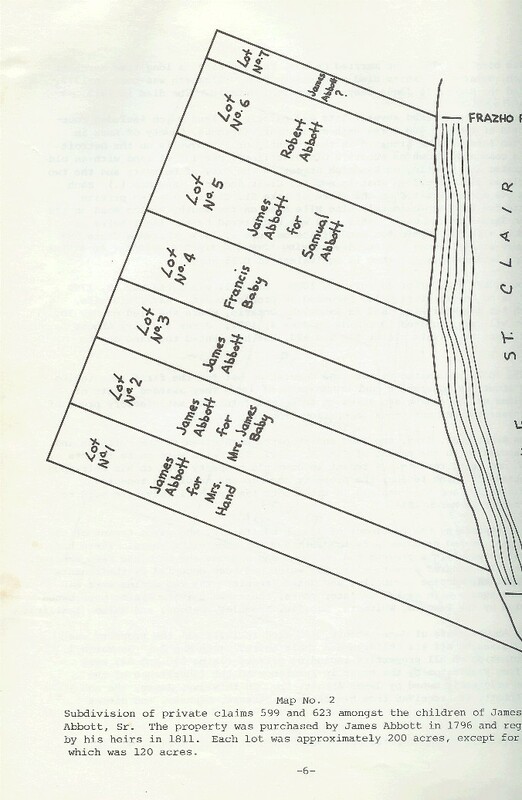 Early French settlers originally founded the land that is now the City of St. Clair Shores in the 18th century. Beforehand, Chippewa and Potawatomi Native Americans occupied this land, as well as most of the west coast of Lake St. Clair. 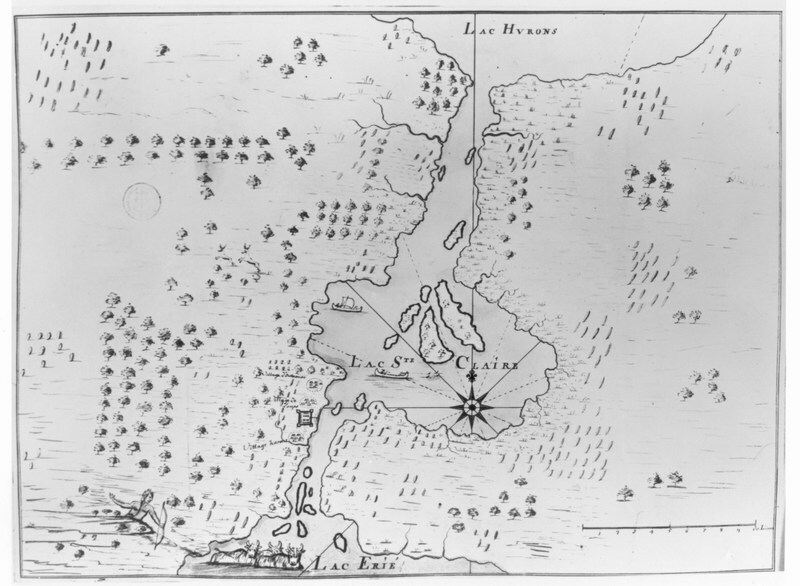 As the French began to outline this coast, they constructed a system of strip farms; the largest measured about one tenth of a mile in width by a mile in length. Each farm was on a piece of shoreline, from which private irrigation systems were formed. Just off the lake is where the French built their homes. Walking along the shore, a settler would see an extended row of log cabins facing the water, with elongated pastures, farms, and orchards in the background.